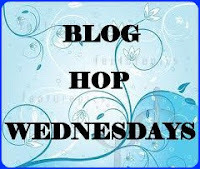 BlogHop is introducing me to so many wonderful blogs and some mouth watering recipes. I'm posting Neha's Jeera Aloo from From My Heart (visited for bloghop5) and Umm's Ragi Atta Roti from Taste Of Pearl City (visited for bloghop4 ). I missed last bloghop post so friends combined both of them together this week. 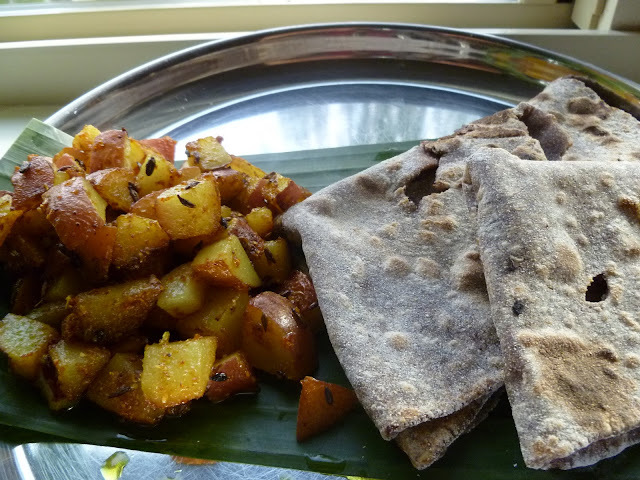 Neha's sabzi and Umm's roti made a wonderful combo and we all loved it at home. Heat oil in a wide pan and cumin seeds. When cumin turns golden add potato cubes. Fry the potato for 2 minutes and add all dry powders. Fry for 3-4 mins and lemon juice and remove from heat. Dill - 2 tbsp chopped finely (Original recipe used kasuri methi - 2 tsp and ajwain - 1 tsp). Boil a cup of water with salt and oil . Add ragi flour and mix well and cook it for 3-4 minutes covered on low. Remove from heat and when its cool enough to handle add dill. Add wheat flour little by little and knead to a soft dough. Roll it out into 10 to 12 cm diameter circle. Heat a skillet pan to high. Cook the chapathi on both sides, until it bubbles and looks lightly brown on top. Serve it with Jeera Aloo :) or any curry of your choice. Healthy and nutritious roti, both looks fabulous..
Yummy combo and nice pictures. Thank you Neha for trying my recipe. beautifully prepared healthy comforting meal. I love such food. good combo- platter looks yum ! wow, the combo on the plate looks mouth watering, aloo sabzi is welcome any time of the day and any day of the year on my plate. aaloo all time fav..n ragi..a health food..grt combo! Luks deliciously good and yummy combo with roti.Luv ur recipes and following U. Hope you'll visit again and follow my space too ! glad to follow u....do visit my blog when u gettime..
Hey dear, I used store bought dabeli masala. You get it in Indian grocery store here in US. Wonderful combination...and the raagi roti is so healthy. Delicious platter of food ~ love it! Delicious combo and looks lovely. Nice combo and I like the raagi roti and bookmarking it. Nice to meet you here. Plz visit my space when u r getting time.